Denver International Airport is about to get a whole lot closer to Downtown. Well, not really, but it will probably feel that way. 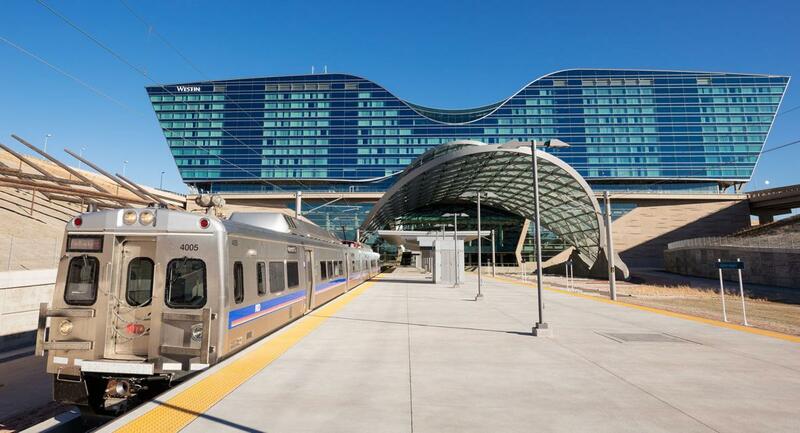 On April 22, the long-awaited University of Colorado A Line of RTD’s commuter rail system will finally come online, allowing passengers to travel the 23 miles from Denver’s Union Station to the terminal at DIA, entirely by rail. This $2.2 billion “Train-to-Plane” project has been in the works for more than a decade and will soon serve a total of eight stations, including Union Station, on the north and east sides of the city. Once in service, each train will be capable of carrying up to 200 passengers per trip at speeds of up to 80 mph. Compare that to 55 mph (if you’re lucky) on I-70. 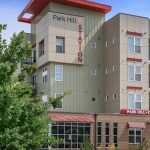 For Delwest, the opening of this line is big news for another reason: One of our developments is located right next to a soon-to-open rail station and is just five stops away from DIA. That means residents will not only be able to quickly and easily jump on the train to get to and from the airport, but the line will also open up access for them to Downtown Denver and points south via RTD’s connecting lines. That’s an incredible amenity that’s hard to put a price tag on in our fast-growing and increasingly-congested metro area. Truth is, there are a lot of things for all of us to love about DIA. At 34,000 acres, it’s the largest airport, by area, in the United States, and our location near the middle of the country means we can get pretty much anywhere we want to go in a few hours or less. And Denver is a major air hub, meaning that we can fly direct just about anywhere in the country too. And the new rail line to DIA is going to make all of those things better in myriad ways. Easily one of the most frustrating aspects of flying into or out of DIA is the parking situation. Not only are the lots notoriously undersized—good luck finding a spot in a garage on a Friday in the winter—but the costs of leaving your car at the airport can easily add hundreds of dollars to even short trips out of town. As of 2016, spaces in the DIA garage lots run $24 per 24-hour period, and the economy lots are priced at $13 per 24 hours. That’s no small expense when you’re leaving your car there for five, six, seven days or longer. The new commuter rail line will alleviate this problem in two ways. By offering a fast, efficient travel to and from the airport from Downtown, it will be easier for travelers to forgo the car and simply take Light Rail. This will not only eliminate their own parking hassles, but it will mean that fewer people will be driving to DIA and using the lots overall, freeing up space for those that do choose to drive. As mentioned, it is not an inexpensive proposition to drive out to DIA. In addition to the cost of parking, gas for the 35-mile journey adds up as well, and don’t count on taking a taxi or Uber to save on the cost of parking. Given the distance from downtown, taxi rides can easily exceed $50 each way, depending on where you’re coming from, and Uber’s to the airport regularly jump past $100 each way. There are cheaper options available today, such as taking an RTD bus, but that can be difficult with a large family or while toting heavy luggage. The train-to-plane line will not only be far cheaper than taking a taxi or other car to the airport—travel from Union Station to the DIA terminal is $9 as of the launch—it will be more convenient as well, allowing passengers to either park near the rail station or simply take a car to the station rather to the terminal. An easy way to tell how long someone has lived in Colorado is to ask them what times of day they like to fly in and out of DIA. Anyone who doesn’t take the potential for rush hour traffic on I-70 into account is a newbie. Depending on the time of day, the road conditions, and dozens of other factors, the drive out to the airport or back into town can take anywhere from 30 minutes to well over an hour. And that’s to say nothing of the out-there-and-back-again trip of at least an hour that is part of picking someone up from the airport. The new rail line eliminates that concern entirely. RTD says that the rail trip from Union Station to DIA will take about 37 minutes, including stops at each station along the way. That’s 37 minutes every time, not just when the traffic is cooperating. Perhaps Denver Mayor Michael Hancock said it best when he called the new A Line a “corridor of opportunity” between Downtown and the airport that will connect the busy, vibrant city of Denver with the world. At Delwest we couldn’t be more excited about this new line and the transportation promise that it brings to a region that sorely needs it. Not only will it make the Denver Metro Area a more livable and modern place, but it will give us a new chance to show off to the world the city that we’ve called home for more than 20 years.